On Tuesday, our nation celebrated an historic event as the first-ever all-women Honor Flight arrived at the Women In Military Service For America Memorial. For more than ten years, these flights have brought veterans, including women veterans, to visit and reflect at the memorials built to honor their service. 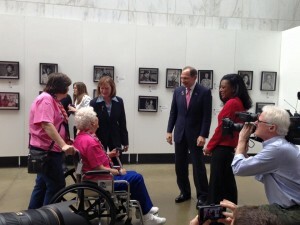 However, this is the first time that an Honor Flight brought only women veterans to D.C. to visit the memorials. 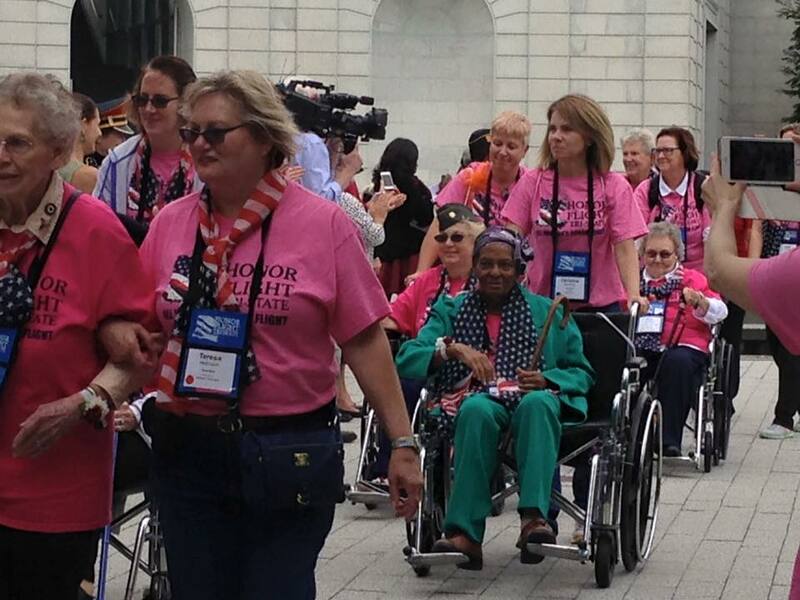 Of the 140 women veterans participating in the Honor Flight, 70 were veterans of World War II and 70 were Post-9/11 veterans. 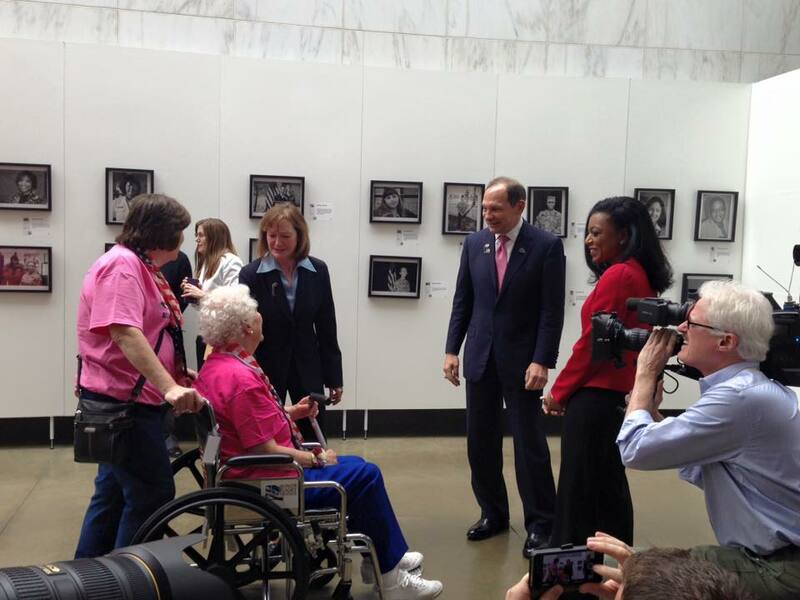 In addition to a cheering crowd of veterans, civilians and active-duty service members, VA Secretary Robert McDonald, Elisa Basnight, Director of the Center for Women Veterans and Rory Brosius, Deputy Director of Joining Forces also gathered to welcome these women veterans and offer words of appreciation for their service. Too often, the contributions of women in the military have been overlooked. Welcoming these women to the Women In Military Service For America Memorial gave us a chance to reflect on the tradition of women serving in the armed forces, and their long history as a critical part of our military operations at home and overseas. While much progress has been made, women veterans still struggle for recognition and face challenges transitioning to civilian life after service. 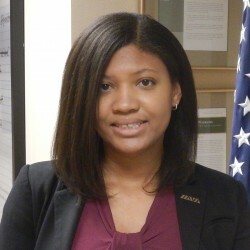 Following the Honor Flight welcome, the VA held a short town hall discussion aimed at connecting women veterans to resources related to health, mental health, housing and economic opportunity after service. This town hall gave many a chance to have their questions answered directly by experts working in these areas, including VSO representatives and representatives from other government agencies. This event was organized by the Center for Women Veterans and also attended by the VA Advisory Committee on Women Veterans, a team of women veterans, service members and advocates who routinely meet to assess the effectiveness of VA programs and initiatives for women who have served. If you were unable to attend this event and are located in the DC Metro area, the Center for Women Veterans will also be hosting its final Women Veterans Campaign event of the summer on Tuesday, September 29th, which will showcase local and national resources available to women veterans. If you are a veteran in need of immediate resources or assistance, we encourage you to contact our Rapid Response Referral Program (RRRP) by calling the toll free number: 855-91-RAPID (855-917-2743) or emailing transition@iava.org.